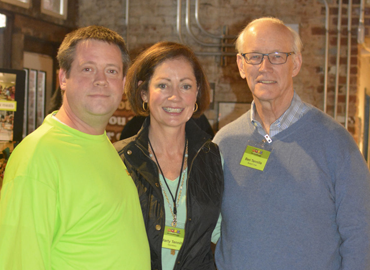 Scott Best, Marty Tennille and Ben Tennille are pictured at the Healthy Wealthy & Wise with HOPE at Wise Man Brewing. The warm, yellow glow shining from within Wise Man Brewing Company was an appropriate backdrop for the Healthy, Wealthy & Wise event on Wednesday. A “run club with a purpose,” the Healthy, Wealthy & Wise event benefits a different organization each week and the latest festivities raised funds for HOPE (Help Our People Eat) of Winston-Salem in conjunction with Signature Real Estate LLC. Founded by Marty and Ben Tennille, H.O.P.E. of Winston-Salem is dedicated to preparing and transporting nutritious meals on Sundays to children in neighborhoods with high food insecurity.